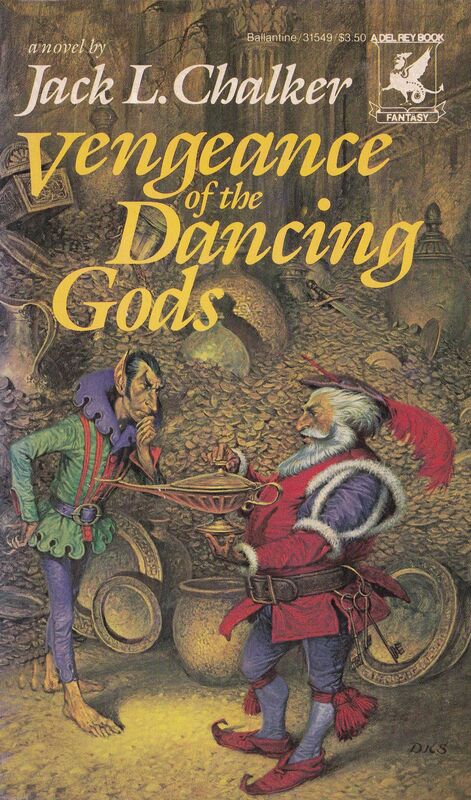 How do the Gods of Dancing get their vengeance? Afflictiing people with a spontaneous wedding disco spell, like that episode of Buffy? Is this what happened to Theresa May? The Rock will be in a remake of ‘Big Trouble In Little China’, but after seeing this cover why even bother. Is the green reptile eating the yellow one, or is the yellow one molting? Only The Shadow (and perhaps the Orion slave girl fairy) know. Still think we could use a “jaunty hip” tag. This cover cries for one. You know, compared to some other covers for this series, this is practically a Michaelangelo. Poor unicorn got his horn bent, tho. Oddly enough, a unicorn rampant actually is my family crest. @Lillie Awesome, could the green lizard be a dragon whose breath weapon is more dragons? The 18-wheeler really ties all the fantasy elements together. Speaking of Michelangelo, the way that painting is divided up with arched panels, it’s a little bit reminiscent of the Sistine Chapel. Does the BEHIND YOU! tag apply when no two objects on the cover appear to exist in the same space? A saucepot tag is needed for those fairies. It must be a rough go for that bird man. Oddly-colored humans can have wings, the horses can have wings, but not some poor schmuck of a bird man. Oh, I’ve just realized something. I don’t think that’s a horn on the horse, I think that’s intended to be his other wing. @Yoss I can see another wing under its stomach, we’ve got wings *and* a horn here, that’s an alicorn if ever I saw one. Maybe we’ve finally found the Hoy Grail—maybe it’s not a Unicorns! or an Alicorns! Maybe it’s the fabled Narwhal upon the parapet! Is there a law somewhere that it’s illegal to make a decent cover for this book? It is better than the Poser-fest we saw before. But wow. Busy. Not a unicorn! but a pegasus! with wings in a bad position. Three of them. Two are coming from its neck (?) but damn if I know where the third is hooked in. Does it have no tail at all, or a neon tail that goes all the way across the picture? How does this critter exist, even with magic in a fantasy world? And yet it didn’t bother me as much at first glance as the big rig busting into fantasy-cliche land did. I think the red fairy’s facial expression speaks for us all. Is there a tag for elaborate borders? Or picture in picture? At least these aren’t curlicued like most fantasy borders, and they went with simple fonts. @Lillie: I think it’s eating. Or barfing. The fairies don’t seem to care about any of the weird critters they’re posed with, nor the Mack truck barreling down upon them… perhaps b/c they’re all in different planes of focus. @FB: I think Behind you! is a warning to Sir Tweety, since it looks like Skirt Boy is hoping to get a set of armor and a poultry dinner in one swell foop. Isn’t that a Ting! on Tweety’s sword? That’s the problem. Sir Tweety looks like he actually belongs in the scene. Both Sword Boy and Money-Bra Girl look like awkward paste-ins. 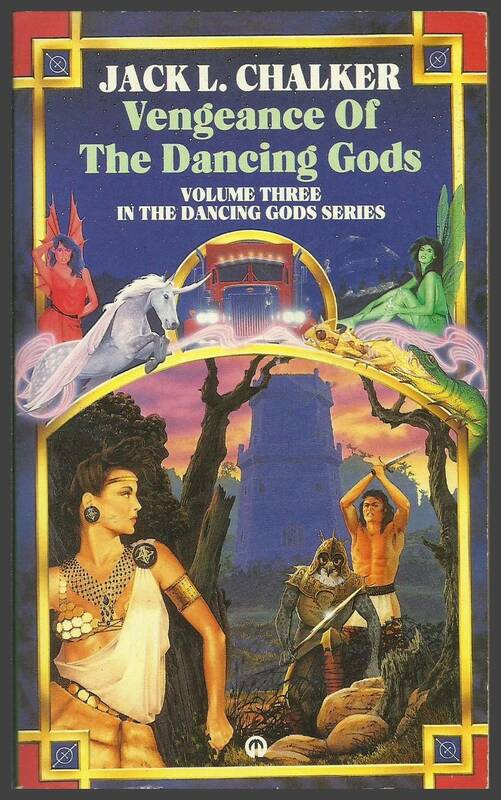 Fantasy cover artists have no sense of lighting. It must be all that magical ting. I wonder if the wizard on these awful covers is intended to look like Jack Chalker? There seems to be a pretty strong resemblance. @FB: Yes! Sir Tweety’s lighting fits with the tower and trees, and exactly with the rocks. He’s more detailed and 3D. Whereas Money Bra Girl is flat, with her very own spotlight (which casts no shadow? ), and Sword Boy isn’t detailed and seems to be painted with much larger, rougher strokes. Like a lot of people, I can’t always articulate what exactly is wrong about some of these covers, but everyone has an unconscious sense of lighting that registers these terrible covers as subtly or badly wrong. Bah. Let’s be honest, I’m just killing time till the new “Doctor Who” on Sunday anyway. 64 minutes of new Who. Yay! I think I know what the woman is hiding from….That’s one hell of a cod-piece for Bird Boy. Anyone know what this series is about? With one exception, everything about the covers says “generic fantasy”, but that exception is pretty glaring- literally, what with the headlights. A bit of reading says this is all a parody of generic high fantasy questing, with everything possible thrown in. The hero and heroine come from our world, which I guess explains the truck? Well, I always suspected that “The Lord of the Dance” was some kind of divine retribution for our sins.